If you were around in the early 90’s, surely you remember the Dream Team. If not, imagine a time when the sport of basketball was flooded with incredible players, and an Olympic team was assembled of among the best men to ever play the sport playing their respective positions. Unsurprisingly, they took home the gold. 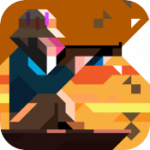 If an iOS equivalent exists, it has to be the team of guys behind the recently released Ridiculous Fishing. Vlambeer, responsible for Super Crate Box ($1.99), Zach Gage, the man behind our 2012 Game of the Year Runner-Up, SpellTower ($2.99), Greg Wohlwend who have made too many amazing games to list, and Eirik Suhrke, the maestro behind both Spelunky and Hotline Miami responsible for the soundtrack. Put those guys together in a room, and similarly, they’re going to produce gold. What started as the Flash game Radical Fishing has since been endlessly refined into a game that I’ve been unable to put down. 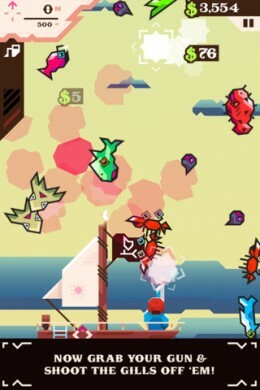 The premise of Ridiculous Fishing ($2.99) is identical to that of its Radical predecessor: You start the game by casting your line into the water, then you tilt your device to control where your lure is in the water. Ideally, you want to get as deep as possible, avoiding all forms of aquatic life. The first time you collide with something, the music gets reversed and you start reeling in your line. 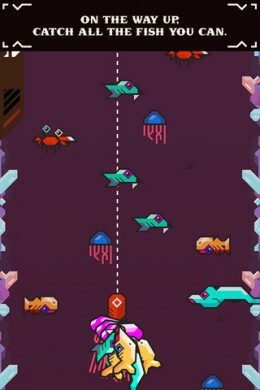 At this point, the goal is reversed in that you want to collect as many fish as possible, similarly by tilting. Anything that hits your lure gets picked up, and once you break the surface of the water things get really crazy- You actually catch fish by shooting them with whatever firearm you have equipped at the time. Each of them behave a little differently, so you might be tapping or sliding your finger around to kill fish. On top of the basic mechanic(s) of the game rides a persistent upgrade system where you’re earning money from your catches and then spending it on different upgrades ranging from new line to fish deeper, new weapons to kill more effectively and more. Of particular interest is the ability to add both a toaster and a hair dryer to your line to negate two accidental collisions to fish even deeper. You eventually get a, err, chainsaw-type attachment to add to your lure, allowing you to dash through fish to get even further underwater. The way all of these upgrades build on top of each other feels great, as Ridiculous Fishing totally gives off almost Doodle Jump-like “I could play this forever" vibes while providing the whole “Aww man, I only need $1,000 more for this next item" to keep you playing even more. The combination is incredibly dangerous for your spare time. I won’t spoil it, but the game even has a plot of sorts told through a in-game faux Twitter feed called “Byrdr." There’s even an ending to work towards, which then unlocks an endless mode where you can compete for high scores. Ridiculous Fishing is such a complete package that it’s an effortless recommendation. It totally captures that gameplay niche of a game you can load up and play for a few minutes while providing a feel of progression that also makes the title suitable for substantially longer play sessions- Especially once you start to discover some of its secrets and other particularly effective techniques for maximizing your score. There’s no IAP to speak of, and the whole game feels like a cohesive whole. 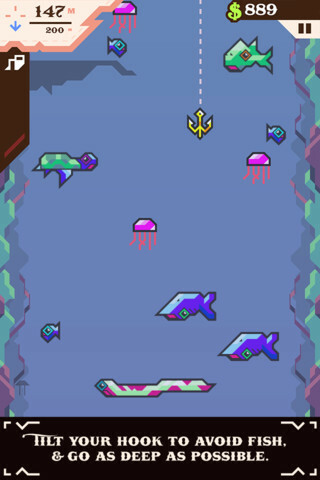 You need to download Ridiculous Fishing, that’s really all there is to it.